A spirit of health and well-being is alive and well in New Brunswick this summer with the return of the New Brunswick Community Farmers Market. The market, a project in partnership with the City of New Brunswick, Rutgers Cooperative Extension, and Johnson & Johnson, now has a bigger presence than ever with three locations throughout the city, each opening on a different day during the week. All three locations are open from June through November and had their official grand opening the week of June 14, 2015. The farmers market brings fresh, local and healthy food directly to the residents of New Brunswick and supports the city’s mission to give them access to nutritious food on a consistent basis while also supporting local farms. “We are so encouraged to see our community embrace the farmers market and have direct access to local, health food options. It is programs like this that support our mission to create a culture of health throughout the city and combat obesity,” said Jaymie Santiago, NJPHK – NB partnership coordinator & director of operations of New Brunswick Tomorrow. The farmers market is just one of the many programs the City of New Brunswick is backing in an effort to improve the lives of its residents. Through the start of Live Well-Vivir Bien New Brunswick, a city-wide campaign with a mission to encourage residents to take ownership of their health and well-being by utilizing local health resources, the City of New Brunswick, Johnson & Johnson, Rutgers Robert Wood Johnson Medical School and New Brunswick Tomorrow have come together to create a means to do just that and make a significant impact in the community. “Spreading the Live Well-Vivir Bien message through outlets like the New Brunswick Community Farmers Market is just the beginning. It is an exciting time to be living in New Brunswick and we are ready to “live well” with the residents we serve,” said Monica Reyes, Manager of Communications and Development with New Brunswick Tomorrow. 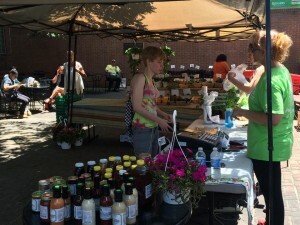 The New Brunswick Community Farmers Market is part of the Farmers Market Coalition, a national network that promotes farmers market awareness and Farmers Market Week. This year Farmers Market Week will take place the week of August 2, 2015. For more information about the New Brunswick Community Farmers Market visit www.nbcfarmersmarket.com.